There’s a phrase once heard in television commercials and now common on social media: life comes at you fast. The social media gag is often used to expose pundits who advocated position X two years ago, and now advocate position Y. Sometimes there has been a real evolution of thought, while at other times the critics have rightfully noted mere inconsistency. The phrase bears close resemblance to Matthew Broderick’s closing monologue in Ferris Bueller’s Day Off, “life moves pretty fast.” For those who grew up in the 1980s, it was often more than a memorable line. It was a guidestone, the sort of phrase that morphed from a senior quote in the yearbook to a life principle that informed decisions in college and young adulthood. 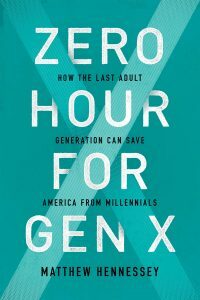 In Matthew Hennessey’s new book, Zero Hour for Gen X, the associate editor at the Wall Street Journal acknowledges that in recent years life has moved pretty fast, and it’s up the Generation X to try and slow it down. Hennessey is himself a member of Generation X, having entered young adulthood in the 1990s. He spends much of the book recounting life for this generational cohort. Hennessey looks back at a long list of life experiences stretching from Watergate, the American Bicentennial, the election of Reagan, the fall of Communism, the dot.com boom and bust, Monica Lewinsky, Bush v. Gore, and September 11. These events went a long way to shaping the outlook of Generation X, both its innocence and its experience. Beyond this detailed history, Hennessey gives the reader a wistful remembrance of life in the 1970s and 1980s. Kids were left home alone! No helmets on bicycle riders! Though meandering at times, this extended passage is incredibly helpful for establishing the core of Generation X’s identity. More directly—and Hennessey takes his time getting to this point—the author defines Generation X in large measure by the fact that its members did not enter the digital world of Microsoft, Apple, e-mail, and the Internet until their late teens, at best, or more likely, early adulthood. That is to say, Generation X grew up in the analog world and still exhibits a strange detachment from the “internet of things,” a phrase Hennessey uses early and often, to great effect. If Generation X is to save the America from the millennial revolution and its bizarre attachment to an overly connected, digitized world, this detachment may need to grow into a full-throated divorce. The millennials pose a very real problem for Hennessey, and technology is at the root of that problem. Sure, there are the issues with helicopter parenting and high-strung demands for validation, but the core problems with millennials revolve around their connectedness to the internet of things. In happily attaching themselves in such a manner, millennials have gleefully given up notions of privacy. There are no closed spheres anymore, and everything from dating to professional accomplishments are now publicly displayed in a manner heretofore unknown. Millennial overdependence on technology has left them strikingly ignorant on any number of topics necessary for good citizenship, while years of affirmation and self-esteem boosting have left them unable to accept there may in fact be a lot that they don’t know. Making matters worse, according to Hennessey, is the tendency of companies and startups to favor young employees at the expense of older ones, locking all of us in a vicious cycle at the mercy of millennials. The author’s solution? Drop out, mostly. Hennessey admonishes his readers to simply pump the brakes on the internet of things. Avoid the Amazon Echo and other devices that connect your home. Try to avoid the overly connected car computer system. Use a smart phone if you must, but put the thing down when you come home. Above all, there is a strong word for parents to keep devices out of the hands of their children. It’s not quite the Benedict Option, but it’s strikingly close. Hennessey is adamant that Generation X push back against the tide of digitization, arguing, in true conservative fashion, that such decisions begin with the individual and the family. Hennessey expands his argument beyond simply saying “no” to the latest connected gizmos and gadgets. He also argues for investment in material things. Buy books. Buy CDs and records and quit downloading or streaming everything in a manner that robs artists of compensation. Shop local as much as you’re able. Choose maple syrup—real stuff pulled from a live tree by living people—over synthetic corn syrups. These are habits often tossed around by crunchy limousine liberals and fussy conservatives who think all of life should resemble Wendell Berry’s Port William, but the author doesn’t shy away from them. What is commendable about Hennessey in this regard is how grounded he is. He doesn’t argue for a retreat to the countryside and he doesn’t spend time worrying about the overall decline of culture. Hennessey makes a straightforward case that pervasive connectedness is a detriment to our lives. Moreover, it is simply unnecessary. This digitized life is a self-fulfilling prophecy. We bring these burdens on ourselves and we possess the means of undoing them. That is the task before Generation X as it moves into full adulthood. It would be easy to criticize Hennessey for not going further. He makes no strong claims about religion and he doesn’t go particularly far in exploring new ways to build community (though he does venture into discussing community). Yet that’s not really the point of the work. The thrust of the book is simply to remind Generation X who and what it is in order that it might assert that leadership role that rightfully belongs to it. It is not a good thing to acquiesce to the internet of things, but it is only Generation X that can stop it. Hennessey’s call to arms is lively and fun, but it is also very serious. This is a fine polemic and it makes a nice compendium to other recent works by Nicholas Carr, Sherry Turkle, Alan Jacobs, and Matthew Crawford. If Hennessey is right, and now truly is the hour for Generation X to stand athwart Silicon Valley yelling “Stop!” then his book could not be timelier. Matthew Stokes holds an M.A. from the University of Alabama.